I so often see asymmetry in saddle fitting and Dr. Ridgway helps explain one of the issues that causes this and what effects it has on saddle fit, the gaits, soundness and so on. Very much worth the read. The commonly observed condition where the heel of one front foot is higher than the other has ramifications that extend well beyond the effects on the foot itself. This condition is also observed in the hind feet, though less frequently. However, because of limitations and scope, this chapter will direct its attention primarily to high heel/low heels of the front feet. 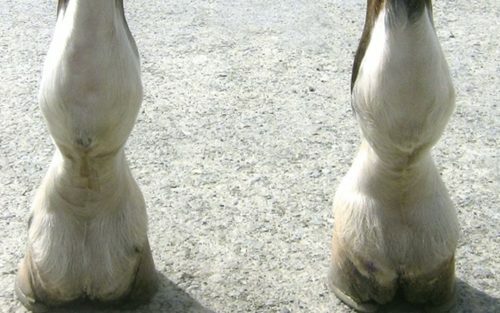 Pat Thackery, a well known and very educated farrier from Idaho, has stated that 60% of the horses in his practice have asymmetrical heel heights. We need to decide what that means and whether it is normal—and thus an inconsequential finding. Do some need to be corrected while yet others do not need corrective procedures? Since nearly everyone I have ever known has grown up in a dysfunctional family, it must be “normal,” to be from such a family, but is it good or healthy in a mental or physical sense to be imbalanced? We cannot simply dismiss the syndrome that lightly. How to best deal with the condition has remained a “hot topic” among farriers and veterinarians for a very long time. It is the aim of this chapter to explore some of the biomechanics and often unrecognized ramifications—such as creating difficult saddle fit problems, muscle imbalances, and changes in posture. All of these can result in loss of performance and are a potential source of lameness. When there is asymmetry in the body or limbs, there is compensation. Where there is compensation there are postural changes. Where postural changes exist, locomotion will be affected. When locomotion is no longer symmetrical, performance and eventually soundness will suffer. I think that, whatever the source, a case can be made that the limit of the body’s tolerance for asymmetry is not infrequently exceeded and in these cases, horses need all the help they can get. Especially, that is the situation if they are to be ridden and even more so the situation if a high level of performance is expected. There is a remarkable body tolerance for asymmetry of most structures. Our job as veterinarians, farriers, and riders is to be able to recognize where asymmetric tolerance ceases and pathologic change and damage commence? Why is it exceeded? In a natural state, if wild horses exceed the range of functional asymmetry, they become part of the food chain. In our domestic world, without judgment, we tend to breed any-and everything, and discard or cull nearly nothing. By our management practices, it is my contention that we place many horses into the gene pool whose asymmetries go beyond the balance tolerance point and create pain, performance deficit, subclinical lameness and eventually overt lameness. The problem is compounded by many factors. These include: inappropriate riding, inappropriate trimming, inappropriate shoeing, inappropriate musculo-skeletal manipulation, inappropriate saddling and inappropriate veterinary procedures. In my career as a veterinarian specializing specifically in performance horse issues and subclinical lameness, muscle tension, imbalances and symmetry since 1990, I deal daily with muscle issues, saddle-related problems, shoeing-related problems and back pain. These problems constitute as much as 95% of my practice. That has afforded me ample opportunity to observe and evaluate the relationships of asymmetric heel height to pathologic consequences on a first-hand basis. Awareness of some of the problems came to me about many years ago via Moses Gonzales, journeyman farrier. He demonstrated to me the effects that a low heel/high heel syndrome had on the horse’s posture and performance. Farriers and veterinarians, all too often, counter Gonzales’s observations with skepticism or antagonism. Healthy skepticism is always appropriate, so let us try to examine the issues on their merits. I believe that antagonism needs to be challenged and skepticism addressed. At the very least, this subject needs to be revisited with an open mind. Appropriate trimming and/or shoeing combined with appropriate bodywork and riding remains the key to soundness. Significant awareness has come from recognizing that the syndrome can grossly alter the shape of the shoulder and the back. Altering the posture and shape of the shoulder and wither area creates problems with saddle fit. The resulting posture of the horse affects not only saddle placement but also alters the rider’s posture and balance, and ultimately the rider’s soundness. Which foot is the “abnormal” foot? To begin to answer this, it is necessary to talk about the possible reasons why the horse has the syndrome in the first place. Also, it is important to define what we are calling a low heel and/or what we are defining a high heel. You will note that not infrequently, the so-called “high” heel is actually of a very acceptable height and the limb shows a good pastern axis and hoof angle. Radiographs of this foot may be very acceptable. In this case, the low heel is likely under-run to some degree and exhibits a long toe with flare present. This is a common form seen with the issue of laterality, i.e. “left or right handedness.” In the horse’s case, it is better expressed as right or left forelimb dominance. Since this is a source of asymmetry, there may well be a genetic predisposition. Let me emphasize, however, that which foot is high heeled and which is low heeled does not always fit the model provided by laterality. We need to look further. Crushing injuries to ribs and nerves exiting the spine, especially between T-3 and T-8. Such injuries are often associated with manual assistance, especially in “maiden” mares and difficult births. They are much more common than realized. Predisposition to contracted tendon or tendons. Trauma to muscles, tendons, ligaments, or acquired vertebral dysfunction. Trauma from falls, rough play, or exceeding work load capacity. Trauma induced by improper trimming or shoeing. Trauma resulting from running into fences or other objects. Other less-frequent causes include foals, whose mother allowed them to nurse only from one side. This will sometimes happen in mares that have pain from stomach ulcers. Any of the above categories can create a toe first landing or difficulty in adequately advancing the limb. For any of the above reasons, the foal may choose a pain-compensating posture that will allow it to graze. If the foal has adapted its stance because of pain or discomfort, it eventually becomes a habit—and can then last beyond the period of pain. It is for these reasons that I consider the “grazing pattern” more of a symptom and a consequence rather than the initiating cause of most high heel/low heel problems. The exception is the ones where laterality is a major issue. More on that later. Let us first discuss the overall postural deviations that are a direct consequence of the lower of the two heels. This chapter is not specifically addressing an anatomically “short leg” syndrome, (though to a cursory evaluation, the limb with the lower heel may give the appearance of a shorter leg). The low heeled limb is functionally shorter—not likely to be anatomically shorter (the limb of the high or clubbed foot would tend to be anatomically shorter in cases of true limb length disparity). It is the variance in joint angles that changes the functional length. The joint angles are governed by the action of muscle tension on the joints. A lower heel creates obvious changes in the joint angles at the pastern, fetlock, elbow and scapulo-humeral joint (shoulder joint). Compared to the limb with the higher heel, the angles on the low-heeled limb will open (get larger), and the limb will become more vertical than its counterpart throughout its length. The pastern joints and fetlock will be placed in more extension (and possible subluxation). The elbow angle will be more open. As the scapulo/humeral joint (shoulder joint) opens, the “point” of the shoulder will be moved caudally, so its position is farther back than on the higher-heeled limb. The position of the scapula becomes altered so that it rotates more vertically. This verticality creates a bulging appearance to the shoulder and over-development of the associated muscles on the lower-heeled limb. This asymmetry in the shoulder will cause the saddle to not sit straight on the horse. The pressure that a “crooked” saddle places on one side of the thoracic spinous processes leads to pain and primary chiropractic issues of the upper thoracic vertebrae as well. posture that the horse seeks in order to be comfortable. Commence assessment of the forelimbs by observing the horse’s posture, its joint positions and angles from several directions. To be meaningful, the horse must be on a flat even surface. The horse must be standing “squared up” on all four feet, and allowed to be bearing weight in its chosen posture. Ideally, the assessment is best performed after the horse has been trimmed and balanced. Having one hoof placed even 3 to 4 inches ahead of, or behind the other, can alter the accuracy of the evaluation. Start the observations from six to eight feet away, in a position directly in front of the horse. Observe—progressively from the foot upward—the position and relative heights of the joints. The foot with the lower heel will usually be significantly larger. Often, the greater the size difference, the longer the low heel/high heel condition has likely been present. Difference in hoof size is a prime indicator that High Heel / Low Heel exists. (Also while in this observation position, evaluate the coronary band for possible evidence of medial lateral imbalance. Note this is only one factor in medial lateral balancing. The fetlock joint on the lower-heel side is generally lower than the higher-heeled side. Next, check the position of the styloid process of the radius. This is the “bump” or “top of the shelf” on the upper medial side of the carpus (knee). It is commonly lower on the low-heeled side. As the next step, evaluate and compare the height and symmetry of the points of the shoulder (scapulo-humeral joint). Generally, it will be noted that the joint appears lower on the low-heel side, and that there is hypertrophy of the descending pectoral muscles on the side with the higher heel. With practice, it can become evident that the shoulder point on the lower heeled side will also be placed more rearward. For an overall picture of the asymmetry, it can be very helpful to look at the spatial symmetry created by the inner margins of each limb and of the ventral aspect of the chest wall. In other words, look not at the limbs themselves but use them as a “picture frame” of the space between the limbs. Next, stand several feet away from the shoulder, at a 90-degree angle from the horse’s direction of stance. From this position, it is easy to see difference in pastern angle. In many instances, from this position, the pastern axis can be observed to be “broken backwards.” Broken-back pastern axis is accompanied by varying degree of subluxation of the pastern and coffin joints. The toe may appear to be longer on the low heel side (see chapter 22). The shoulder joint can now often be seen to be anywhere from ½ inch to 2 inches rearward of the shoulder on the limb with the higher heel. The difference in heel height and angle is best seen by positioning one’s self another 45 degrees toward the rear of the horse and from about six to eight feet away. Next, the horse should be evaluated from behind and slightly above the croup. In order for a shorter person (or when examining a very large horse) to adequately make this evaluation, it helps to stand on a sturdy object of some sort. It will be noted that the shoulder of the limb with the lower heel will usually appear to have a significant lateral “bulge” and it will appear to be higher than its counterpart. This is because the scapula has been rotated into a more vertical position. The shoulder with the higher heel will often appear to slope or fall away in an exaggerated manner. Saddles are, for obvious reasons, built symmetrically, so when placed on a horse with muscle hypertrophy (enlargement) on one side, and vertical rotation of the of the scapula on the low side, the tree rotates diagonally. By doing so it establishes a more equal contact pressure on both sides of the “wither pocket.” Torque of the saddletree, however, may make contact and place excessive pressure on one side of the lightly covered (no muscle cushion) thoracic spines and leaves more open space on the opposing side. Pressure exerted in areas close to bone (with little muscle covering) result in a significant magnification of the pressure. The result of this unilateral pressure is pain, and loss of ability to perform bending and lateral movements. The pressure can also create chiropractic joint issues in the thoracic vertebrae of the withers. The shoulder that is “bulged” laterally may strike the edge of the panel or bar as the scapula moves through its range of motion. This can create significant muscle bruising and serves to further twist the saddle. Because the opposite shoulder typically has more slope, the saddle may tend to fall or slip to the sloping shoulder side of the horse. This is a second reason for pressure on the thoracic spinous processes. The problem of slipping to the side is particularly troubling if the croup is also involved and is lower on the same side. This is can occur when a high/low condition exists in the hind feet as well (very subtly, the diagonal hind is always involved when the fronts are mismatched). When the horse is observed in motion, the croup raises more on one side than the other — it relates to muscle balance, chiropractic or joint issues in the hind limbs. Regardless of cause, it creates an even worse scenario for slippage when combined with shoulder asymmetry. The resulting hypertonicity can and does lead to lameness via the following biomechanical factors. The consequences for the horse are muscle pain in the shoulder(s) and shortening of stride. When any animal experiences pain, the response is to alter the posture. This leads to inappropriate loading of a limb while moving within the required gaits. When the skeletal system support is inappropriate or inadequate, the muscles attempt to take on the load. Performance is compromised, as the condition leads to subclinical and eventually outright lameness. A rider who must alter his/her position and posture because of improper position of the saddle will eventually create further performance problems and increase the risk of lameness for the horse. Most “crooked riders” have slowly allowed their bodies to compensate and are usually quite unaware of their compensation until it is brought to their attention. Thus, the rider may end up with chronic back, hip or knee pain. The crooked saddle and side slipping saddle causes the rider to place more weight in one stirrup than the other. This also contributes to creating a “crooked” traveling horse and, therefore, is a cause of subclinical and eventually clinical lameness. There are many other postural deviations of the rider that can add to the problem. Horses and humans are masters of compensation and adaptation. Both require good bodywork to overcome the adaptations and correct the compensations. Upper thoracic (wither) vertebral chiropractic problems are one of the most common reasons for a horse to react badly to the tightening of the cinch or girth. Dysfunction here creates neuromuscular irritability in the muscles of the shoulder and in the area covered by the girth or cinch. Girth pain is too often considered “normal” or just a bad “behavioral” response. I contend that 90% of these horses are reacting to pain. The pain from the saddle creating pressure, and the neuromuscular stimulation of the shoulder muscles creates a chain of muscle shortening in the caudal shoulder and forelimb muscles that can and does lead to superficial digital tendon strain and suspensory strain and eventual suspensory tears. As a side note on performance issues, these horses typically experience trouble with a lead or lead change and may tend to cross canter. In cases not complicated by other musculo-skeletal issues, it occurs in the lead on the side of the higher heel. About 80% of horses are low-heeled on the left front foot, so in most (uncomplicated) cases, the horse has more of a problem picking up or maintaining the right lead. With regard to the foot itself, the syndrome produces a long toe with the heel becoming under-run. This leads to inadequate support of the caudal foot, and to a lack of development of the digital cushion and lateral cartilages (see chapters 1, 3 and 19). A lack of internal caudal foot development leads to a “broken pastern axis” that is very difficult, and in some cases impossible, to correct. It is not uncommon to see large, flat and splayed out frogs (prolapsed frogs) accompanying the foot with a degenerated digital cushion., The frog growth is a functional compensation for the lack of internal support in the back of the foot. There is also an obvious consequence to be recognized with regard to major factors that lead to “navicular syndrome.” Among these factors, a horse with long toe/low heel tends to “break” the pastern axis and place much more chronic stress on the deep digital flexor tendon. The deep flexor tendon is, in turn, putting pressure on the navicular bursa and impar ligament. Another very important component is that these horse land toe first, and as Dr. Bowker has shown, this also contributes to the development of “navicular syndrome” (see chapter 1). There is a wonderful adage that when one finds a problem one needs to look elsewhere for the source. There have been many theories about the reasons for high/low heels. Regardless of the originating factor, whether genetic or acquired, we are all aware that the horse—once the condition is established—will typically graze with the lower heeled limb advanced. It is certainly a reasonable theory that pressure (on the heel), maintained through many grazing periods, distorts the hoof capsule, unbalances the foot, advances the break-over location and causes the heel to become under-run. Pressure over time creates distortion. Distortion equals an unbalanced foot. So the foot must be addressed, but that is not the full story. It is axiomatic that bones assume the position that muscles dictate. The bones of the forelimb are no exception and heel height is thus affected. The joint angles that are formed with the consequence of one limb being functionally shorter are typically associated with tension in muscle groups. So, one can certainly postulate that some initiating trauma has placed the muscles of one limb in tension and functionally shortened that limb—leading to a functionally different limb on that side. The trauma may exist from birth or from later-acquired trauma; but either way, it leads to a habituated muscle shortening. This is an aspect that can often be addressed by appropriate bodywork in many forms: including acupuncture, chiropractic, deep massage, myofascial release work, stretching, and corrective riding exercise. Correct saddle fitting is also a key part of the equation. By laterality, I am referring the human equivalent of being right-handed or left-handed. In the equine, it is better described as right or left forelimb dominant, or as the Germans have described it for centuries: “the naturally crooked horse.” What this essentially means is that horses are crooked in their bodies, and the hoof capsules change from normal in response to that crookedness. The degree of front limb dominance varies from severe to mild. The horse that is more ambidextrous will show the least tendency to asymmetry and will also be a more athletic animal. Most horses show a significant degree of laterality. To understand why laterality is significant, it is useful to compare the human as a biped with the quadruped horse and understand the biomechanics that come into play. To keep things simple, I am always going to refer to a right dominant person or horse. Obviously, left dominance will present a mirror image. The percentage of humans or horses that are right forelimb dominant is approximately 75 to 80 percent. Understanding how it works in the horse can be a bit confusing—that needs to be addressed. Most horses tend to have their left side hollow (the easy side) and the right as their difficult lead and stiffness, so it would be easy at first glance to conclude that most horses are “left-handed.” It is an inaccurate conclusion; so let me explain. If you are right-handed, you are dominant with your right leg as well. If a right-handed biped loses his or her balance and starts to stumble or fall, that person will automatically catch him or herself with the right leg and use the right arm to regain balance. If the person continues to fall, the right-handed biped will stop the fall with the right arm. Now consider that the horse that, by nature, is a grazing animal. It is designed, to be on the forehand in order to support a comfortable and efficient grazing pattern. Thus, sixty percent of the standing horse’s weight is carried on the front legs. Metaphorically, this means that the forelegs are the posts that keep it from falling on its face when it grazes or moves forward. So, as it moves to the next bites of forage, the hind limb propels the horse forward and it catches and braces itself with a forelimb so as not to stumble or fall. The right forelimb dominant horse, like the right handed human will preferentially use the right front leg to prevent “the stumble or fall” and as the principal supporting limb. What Does This Mean To The Foot? Typically, the right forelimb will show more muscle tone (tension), and actually tone to the point of hypertonicity in the shoulder muscles. This means the horse has typically develops an excess degree of muscle tone or tension that produces pain. As a consequence, the right shoulder does not advance as much as the left and the foot flight/stride has a slightly shorter stance phase than the left front. (The horse will then carry itself asymmetrically in order to travel in a straight line.) The effect of a shorter stride means that the foot’s balance point will be farther forward. There is not as much weight placed on the heel at impact and this will result in a higher heel developing on the right side. The front foot on the left will reach farther forward and its balance point will be more rearward (palmar). The result will be a strong tendency for the left front to exhibit an under-run heel and longer toe. Flare of toe is usually an accompanying consequence. Perimeter shoeing of this foot can only make the problem worse. Right forelimb dominance is so often the reason for heel height asymmetry, and is why we see the higher heel more commonly on the right side. Now let’s address grazing pattern. Because the right forelimb dominant horse supports itself more significantly on its right front leg, it will, while grazing, place the left forelimb forward of the right front. The grazing pattern will aggravate the under-run heel and long toe syndrome, but the root cause of the asymmetry lies in the forelimb dominance – the “natural crookedness of the horse.” However, it is still imperative that we recognize the other possible causes of crookedness that are addressed in this chapter. In those other trauma-induced scenarios, the high heel of a right dominant horse may be over-ridden by other pathology and result in the left front exhibiting the higher heel (to the point of being “clubby”) even though the horse is right forelimb dominant. For the same reasons, the grazing pattern that becomes established in these other scenarios can aggravate the lower, under-run heel. The trimmer or farrier should evaluate the movement and gait analysis of every horse that he or she works on. The evaluation should be done both before and after working on the feet. What will be observed with the right forelimb dominant (RFD) horse is that when walked in a straight line (or watched ridden on a straight line), the left hind foot will track toward the midline and the right hind foot will track to the outside of the right front foot. They will often carry the croup to the right as well. There is also a tendency for the right hip to appear to drop with each stride. Sometimes the tracking is easier to see when the horse is returning to the person doing the observing. There, the left hind will appear to be traveling in a line between the two front feet and the right hind is carried to the outside of the track of the right front. The pattern may be more obvious at the trot than at the walk. Also, observe the motion of the chest. The Descending pectoral muscle (the breast muscle that is observed when looking at the horse “head-on”) will rise up more on the right side than on the left. This is absolutely consistent in the right forelimb dominant horse and will be seen on the left Descending Pectoral muscle on the left forelimb dominant horse. The thorax is actually being torqued in a counterclockwise direction. How can the hoof issues be best managed? Above all, note that I am saying, “managed” – not cured. Cure is only possible through skilled longeing and riding technique to minimize laterality and emphasize ambidexterity. The fact that 95 percent of the horses will live their entire lives without corrective longeing and riding means that the trimmer or farrier will never run out of cases. With every trimming or shoeing, it is essential, when the low heel is the problem, to set breakover back. Ensure that at least 50 percent to 60 percent of the support is in the caudal foot, i.e. behind the center of rotation of P3 (see chapters 19, 20 and 22). Shoot for heel support extended to the buttress of the frog. Flare must, of course, be addressed but in addition, one must keep after the medial wall height. When the horse is barefooted, the medial/lateral imbalance can be addressed more frequently and better controlled than when a shoe is present for six or eight weeks. In laterality cases, as well as all other causal factors of asymmetric heel heights, management is enhanced by a team effort. The trimmer or farrier’s work becomes more effective when utilizing integrative therapies such as acupuncture/chiropractic and/or good bodywork. This is even more important when the high heel is the pathological one. It is so valuable to educate our clients about the role of laterality and why any person who is involved in veterinary medicine, integrative medicine, professional hoof care, massage or any other form of bodywork cannot “fix” their horse. We can only help them manage the consequential effects. That we can do very well! We can only hope to inspire them to learn more about how to longe and train the horse. Much of what I have learned about the nature and movement of the crooked horse and its correction has come from working with Gabriel and Klaus Schoeneich in Germany. They have been working with and rehabilitating horses with the “natural crookedness” for 25 years and are a wonderful resource. They have a book that is titled Correct Movement in Horses. The subtitle is Improving Straightness and Balance, Kennilworth Press. If the horse is showing a lot of signs of laterality and the feet are a problem as a result of the laterality It is a book well worth recommending to your clients. It covers the methods of the groundwork and the riding work. To achieve desirable results, there must be a team effort between the veterinarian/body worker, the farrier and the rider/trainer. An unacceptable level of heel height asymmetry goes hand-in-hand with asymmetry and pathology at the level of the topline. Therefore, for the many reasons presented, I feel quite strongly (even in the absence of appropriate body work, etc.) it is inadequate to address the foot without appreciating the consequences on the topside of the horse. We must recognize that without seeking and correcting the root cause(s) any other treatment is only palliative. By properly addressing the high heel/low heel syndrome, the trimmer/farrier can be of enormous help to both the rider and the horse. I do not advocate any of the several possible “corrections” such as wedges, lifts, etc. unless I have performed a thorough examination (static and moving) and know the horse’s history and way of going indicate that mechanical intervention is needed. I evaluate by use of reactive trigger and acupuncture points, evidence of inadequate or inappropriate vertebral segment motion, muscle palpation and recognition of pain within a muscle or group of muscles. It is also important to palpate for pain or pathology of the tendons and ligaments. 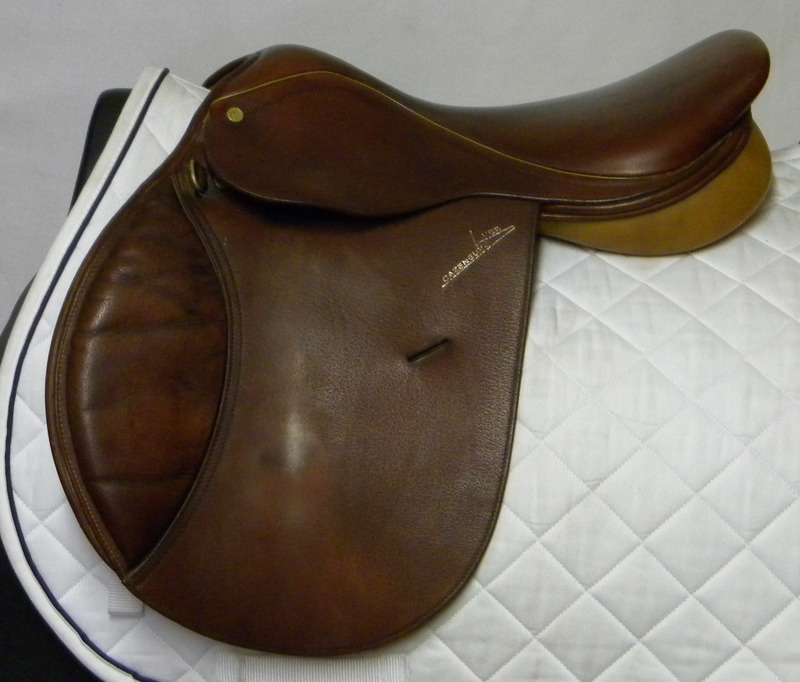 The role of the saddle and its proper fit needs to be critically evaluated as it may be a very key link. 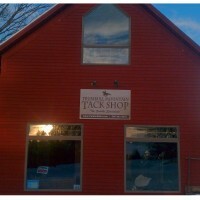 This is an area where well-educated body workers, chiropractors and acupuncturists can be of great help to the veterinary profession and to the farrier. What is the appropriate shoeing for this condition? I feel that in shod horses, it is more critical to identify which foot or feet are pathologic. Is it the higher heel or the lower heel, or do both need to be addressed? Many times, a higher heel is evidence that there is heel pain and that the horse is landing toe-first to ameliorate that pain. In these instances, I have found that correct barefoot trimming has frequently addressed the problem better than corrective shoeing. At any rate, whether the horse is bare or shod, appropriate trim and balance is critical. But even with shod horse, they can most-often be best helped by a barefoot period. This barefoot period may be assisted by the use of hoof boots during the rehabilitation phase. There are many potential causes for caudal foot pain. All lead to further foot pathology; so the need to identify them is imperative. Most commonly, the problem is in the trimming or balancing, where too much sole is removed in order to make the foot “look good and be cleaned up.” The same is true regarding significant trimming of the bars or the frogs. There are few if any legitimate reasons to cut/trim into healthy (or non-exfoliating) sole/bar/or frog tissue. Doing so leads to lack of protection for the internal structures. Other sources of heel pain that need to be diagnosed or differentiated include thrush that may coincide with contracted heels. When there has previously been a lack of adequate frog pressure, the heels will contract. If there are contracted flexors, tendon injuries or joint injuries, the horse may not be able to place the heel fully on the ground and consequently they will develop higher heels that will contract and be more susceptible to thrush. We all tend to look for a single pathology, but must remember that there may be multiple pathologies occurring simultaneously. Additional problems are incurred if the heel of a true “clubbed foot” is lowered excessively without the aid of good muscle therapy. Structures in the muscles called spindle cell receptors and receptors in the musculo-tendonous portion calledGolgi bodies provide signals from the muscle or tendon to the spinal cord. This data provides information to the central nervous system (CNS) about the tension that exists in the muscles and tendonous structures. When the heel is lowered on a clubbed foot, the receptors in the deep flexor tendon are activated and signal the central nervous system that there is too much tension on the tendon. The response from the CNS is to issue a signal to shorten the muscle or tendon structures to prevent injury. This response provides one of the reasons why, by the end of a shoeing period, a clubfoot that has had the heel excessively lowered usually looks as bad (or worse) than when originally seen. Lowering the heel on a non-clubbed foot—but one in which the heels have been allowed to be high—must be done in small increments over several trimmings, combined with appropriate bodywork. I am a veterinarian and make no claims to be a farrier. However, I have undertaken the study of foot issues, shoeing and podiatry for many years now, because no horse’s body issues can be fully corrected if the feet are not reasonably balanced. Simply put, my work will not achieve long-range solution without attention to the feet. My experience, until recently, had lead me to the conclusion that the best course of correction in shod horses is the use of wedges as orthotic devices applied on the lower heel in order to achieve the same heel height and pastern angle as the more upright foot. Pads and wedges certainly can have negative consequences such as crushing the heels. This is especially true if they are improperly applied. Sometimes it is has been necessary to also use a “lift” such as a rim (or full) pad on the same or opposite foot as well, in order to create functional leg length symmetry and allow the muscles to adapt. Selection of wedge height or of a rim pad thickness (on the same or opposite foot), is best determined after the horse has been trimmed and balanced. Again, it is emphasized that this evaluation must be made with the horse standing squarely on a firm level surface and reassessing as earlier described [Note: when indicated, wedging can also be quite successfully done with hoof boot insoles, by trimming the sole of a hoof boot, with epoxies, and/or with casts]. For evaluation, have the horse stand on the trial orthotics (wedges, or a combination of wedges and rim pads) and evaluate for improvement in symmetry. Use the same examination process as previously described. In review, check factors such as the symmetry of the space between the legs, height and angle of the joints, and the height of the styloid processes. Note whether the “point” of the shoulder now comes into symmetry with the opposite side. Again observe from above and behind to determine the effect on angle and symmetry of the two scapulae. Sometimes the changes observed during this procedure are dramatic. In long-term cases (especially in older horses) the changes are subtle, and immediate results are not as evident, but will show improvement in symmetry and performance over the course of multiple shoeings or trimmings. Just shoeing alone for high heel / low heel syndrome may manage the case, but after years of observation, I am of the opinion that by far, the largest percentage of cases are being managed, but not corrected or cured. In other words, the horse is rendered ride-able, but is not made sound. I am a realist and recognize that that is the most we can ever hope for with some horses and some clients, so I do not mean this as a condemnation of the role of shoeing. However, the true cause must be found and ameliorated or eliminated to have a chance of cure and resolution. An in-depth understanding of the back of the foot may, with proper trimming and re-habilitation work (including bodywork) have a better chance of a “cure” through healing the structures in the caudal foot. I have personally experienced resolution with five horses of our own. Whether one is working with shoeing or with barefoot methods, without proper attention to break-over and heel support, the overall condition of the foot can be made worse with the use of wedges. How can this be ameliorated? When shoeing with wedges, the break-over must be set significantly back to approximately 6 mm ahead of the tip of the coffin bone. (Good quality radiographs with the frog apex marked are very helpful.) An improved heel support, often achieved by slight lowering of the heel, should be used to extend the buttress of the heel more rearward. If wedging up the lower heel, the wedge should then extend roughly 1/8 inch beyond the heel of the shoe. If breakover is set as described, the lowering will be compensated and pastern axis will remain correct. If necessary, a higher-degree wedge can be utilized after lengthening the heel by the lowering. The goal is to maintain appropriate pastern axis while giving extended heel support. As with shoeing, the barefoot trimmer must pay the same attention to breakover and heel support—and be sure to modify hoof boots to the same mechanics as well. Following these precautions helps to prevent the heel from further crushing. If the walls are already rolling under at the heels, it is sometimes necessary to trim them lower yet to a level where there is sound, straighter wall growing in the proper direction and not rolling under (see chapter 22). This does not mean cutting into live tissue! If the low heel is lowered more, it follows that the heel should be wedged or treated by other means in order to create the appropriate heel height and pastern angle. When wedges are used, I prefer an open bar wedge and where indicated, rim pads instead of full pads. Frog support may be helpful. An alternative is to use a shoe with a built in wedge, i.e. a wedged shoe. A technique using an acrylic product such as EquiloxTM or Vettec SuperfastTM can be used to build both sole and heel to bring the low heel to balance with the high heel. Caution should be used not to carry the material forward of the widest part of the foot. If there is evidence of a lack of digital cushion and lateral cartilage development, the best course is routine barefoot trimming and maintenance to develop the caudal foot. If shoeing is the course followed, it may be necessary to use full pads and impression material as well as a frog support. Again, shoeing may manage a situation where the internal foot has not properly developed. In the long run, however, it will never allow the internal foot to develop. A barefoot approach has a better chance of helping. In younger horses, there is a better rate of success in re-directing the hoof wall growth, re-balancing muscle development and maintaining a back that can appropriately accommodate a saddle. Quite a few such horses may be taken out of all support after a short period of rehabilitation. Older horses with very long-standing problems and under-developed digital cushions may be best kept in the appropriate orthotics on an ongoing basis. In this case, the owner of the horse should be aware that the case is being managed—not cured. Younger horses may respond to therapy well enough to become fully rebalanced. Older horses may require some form of correction during the remainder of their riding career. In all cases of significant heel height asymmetry, the best results are achieved if the appropriate foot corrections are accompanied by appropriate body/muscle work. For muscle re-balancing to occur following postural correction, the horse must be in work. There is always concern with how much work is acceptable and how soon should work resume after trimming and shoeing corrections have been done. It is, of course, always preferable to err on the conservative side. Work the horse lightly for the first week or ten days. However, I have seen horses remain in athletic competition immediately after the trimming or shoeing changes and suffer no apparent negative effects. I very much believe that an interdisciplinary approach to heel / foot asymmetry provides the best-case outcomes. Cause, effect, and solution require good detective work.